Hoturoa Barclay-Kerr (Tainui) is the captain of the oceangoing waka Haunui. He is the son of Wharetoroa and Ngarungatapu Kerr, is married to Kim and has five children: Namaka, Turanga, Rangiiria, Noenoe and Hinemanu. Hoturoa has been sailing around the Pacific for more than thirty-five years. He paddles waka, sails waka, teaches waka. Hoturoa is an orator on his marae at Kāwhia, the home of Haunui, and the ancient landing and settlement place of his ancestral waka, Tainui and his ancestor Hoturoa. Kia orana no Rarotonga e Atiu mai au. I came to Aotearoa on the 'Moana Roa', a passenger boat from Rarotonga, as a youngster. My sailing experience began during the Kaihoe Waka programme run by Te Wānanga o Aotearoa on the Ted Ashby and Te Au o Tonga. During that time, Aotearoa One was built and completed at Manukau Campus, skippered by Stuart Birnie and managed by Hoturoa Barclay-Kerr. Hearing stories of our ancestors sailing discoveries and navigational skills shared by Mau Piailug. Te Toki members learning to sail with the Hawaiian’s were all good motivators to keep sailing. Joining the fleet of seven waka, funded by philanthropist Dieter Paulmann, was the next chapter of my sailing experiences. I was privileged to be part of the crew to do the blue water sea trials on Te Matau a Maui from Samoa to Vavau, Fiji, Norfolk, and back home to Aotearoa. These voyages led to a series of journeys throughout the Pacific on Haunui waka, including the first leg of the 'Te Mana o Te Moana' voyage in 2011. These voyages gave me experiences with talented skippers like Magnus Danbolt, Duncan Morrison, Gregg Gallop, Frank Kawe and Murray Bright. The MUA voyage to Norfolk and Sydney gave me an appreciation of the talent in our young kaumoana. I was also lucky to sail with Stan Conrad who skippered Te Aurere’s return to Mangonui from Tauranga; completing its circumnavigation of Te Ika a Maui. Ema Siope, my fellow crew member for many voyages, reminded me recently that we’re the 'fossils' of the Haunui waka whanau; she’s mentored our skippers, John Reid Willison and Kerehama McLeod, and I have crewed on a large number of voyagers. Waka life has given me many opportunities to meet new people and experiences such as the 'Waka Warriors' series on Māori TV...I love this kaupapa! Educated in Waikato at schools in Taharoa, Kirikiriroa & finally Rahui Pokeka, John-Reid entered into the waka hourua world on Aotearoa One in 2006 as part of the many rangatahi programmes run at the time by Te Wānanga o Aotearoa, learning the craft from his Uncle Hoturoa, Māmā Liz, Papa Maiti & skipper of the time, Stuart Birnie. Instantly captured by sailing, he returned for a number of sails and to involve himself in waka maintenance and training to be crew. Switching focus in 2008 to a career path in Engineering, John-Reid entered into an apprenticeship in Mechanical Engineering the following year . After a conversation between his father and uncle Hoturoa, John-Reid was called back to join the crew and sail Haunui home to Aotearoa after 'Te Manava Vaka' Festival in Rarotonga, Cook Islands in 2015, and since the return sail from Rarotonga, he has been completely taken by the voyaging lifestyle. Seeing the vast scope of waka kaupapa his uncle was involved with and how busy it makes him, John-Reid was driven to focus and understand the true meaning and responsibilities of what it takes to be a waka hourua kaitiaki, to help support his uncle to continue to grow the waka kaupapa and not have to worry about day to day operations of his waka hourua fleet. After attempting to balance life between work and waka, John-Reid left engineering behind in early 2016 to free himself completely to help his uncle and begin training full-time as Kaitiaki of Haunui, mentored through every step by Ema Siope. Shortly after sailing under Te Mihinui Kawe (senior waka Kaihautū), he was given the honour of trying his hand as a Trainee Captain for Te Toki Voyaging Trust, and with the ultimate support that his uncle had surrounded him with, he was being well groomed into the position. In November 2016, John-Reid completed his official licencing (SRL) as a commercial skipper with the support of other young Training Captains of Ngahiraka Mai Tawhiti. 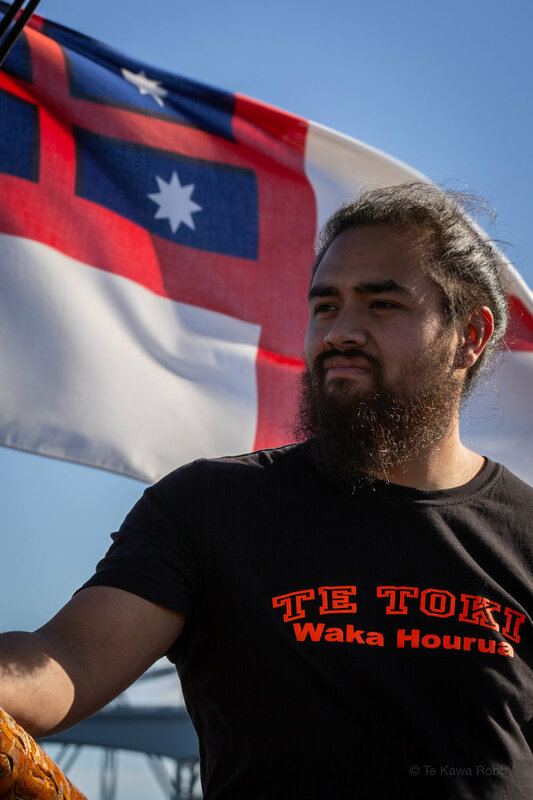 In 2017 he was given the opportunity to fine-tune his leadership and waka skills through sailing alongside many of Te Toki’s senior Captains and Navigators, preparing him immensely for a circumnavigation of Aotearoa’s North Island in 2018 when he captained Haunui and trainee crew. His mentors felt his graduation to the role was proven when he helped lead his crew and waka back to their home Maketu Marae in Kāwhia - the final resting place of the great Tainui waka. Marama was working for her iwi Ngāi Tai as a tour guide on Motutapu Island when she was first introduced to waka hourua in 2015. Haunui and Aotearoa One sailed from Rotoroa Island in the Hauraki Gulf with several endangered Kiwi on board, ready to be relocated to pest-free Motutapu. Marama and her uncle, James Brown, had the role of welcoming the waka and the manu to Motutapu and hosting everybody for the day. When it was time to go home and the waka was departing, Hoturoa invited Marama to sail back to Auckland on the waka. Upon arriving at the Viaduct, Marama knew she wanted to be on the waka again, so she ran back and gave her number to Mama Liz, offering to help with anything she could - two days later she was scrubbing the decks on Aotearoa One - and she hasn’t looked back since. Marama has made a dedicated commitment to supporting the work of Te Toki Voyaging Trust and works closely alongside her (now) brothers, John-Reid and Kerehama, under the guidance of their leaders Hoturoa Barclay-Kerr, Ema Siope, Mama Liz, Anna Marbrook, and many others. With an increasing demand for educational and environmental programmes to become accessible to communities via the waka, Marama’s role involves developing the programmes, writing the funding applications and co-ordinating the projects as well as supporting John-Reid and Kerehama with the daily operations and booking enquiries. Creative genius, and long-time friend of Te Toki Voyaging Trust, Anna Marbrook, has been a key contributor in this space, strongly mentoring Marama into this role. Marama’s passion is in community development and environmental stewardship, and the way that waka hourua give life to these pursuits. Marama is just as passionate about the role of her Iwi and Marae to serve in a similar way, so she divides her time between the waka and Umupuia Marae. She also maintains strong ties with her colleagues from her university days in Wellington, where she studied Performance Design at Te Kura Toi Whakaari o Aotearoa. Though she no longer works full time in theatre and film, she reunites annually with her core crew from around the motu, to make small whakaari that empower community identity and the voices of our young people. ‘Nōu te rourou, nāku te rourou - ka ora ai te iwi’. Kerehama Tamati Te Anaua Mcleod (Whanganui, Taranaki) is the current captain of the waka hourua, Aotearoa One. Born in 1987, Kerehama was raised in Tāmaki Makaurau, however always held a strong connection to his home in Whanganui. For a number of years he was a part of a whānau of river guides on the Whanganui river, steering 6-man Canadian-style dug-out canoes and developing leadership in young people on rivers throughout the Whanganui/Manawatū region, at the same time monitoring the health of waterways and tributaries in the same region. Kerehama was first introduced into the waka world in 2015, when asked to circumnavigate the north Island of Aotearoa on the traditional Polynesian sailing canoe, Haunui. Training for Kerehama began under the mentorship of Hoturoa Barclay-Kerr (founder of Te Toki Voyaging Trust), Frank Kawe (captain), Ema Siope (captain), Greg Gallop (captain), and Rereahu Hetet (watch captain). After completing his first voyage, he was asked to join the crew onboard the Hawaiian sailing canoe, Hokule’a, on its voyage to Aurere in Aotearoa’s Far North, home to distinguished waka builder and navigator, Hekenukumai Busby. In July of 2015, Kerehama was to sail his first open ocean voyage from Rarotonga to Aotearoa at the request of Te Toki Voyaging Trust, which then solidified his passion for helping to keep wayfinding alive in the Pacific. During 2016, Kerehama was heavily involved with waka maintenance on Haunui, alongside waka captain, John-Reid Willison. It was not until 2017 that Te Toki Voyaging Trust asked Kerehama to carry the role of administration and trainee captain, being trained under Stanley Conrad, Ema Siope, and John-Reid Willison, and successfully achieving his qualification as master/captain in November 2017. Kerehama is largely involved with facilitating the many education programmes that Te Toki Voyaging Trust run in schools around Aotearoa and in the Cook Islands, teaching waka education by use of a pop-up Stardome planetarium, and resources that the Trust has developed. Currently Kerehama is passing on a lot of what he has learned to the younger generation of competent Kaumoana (voyagers) and furthering his own learning in regards to traditional wayfinding practices.